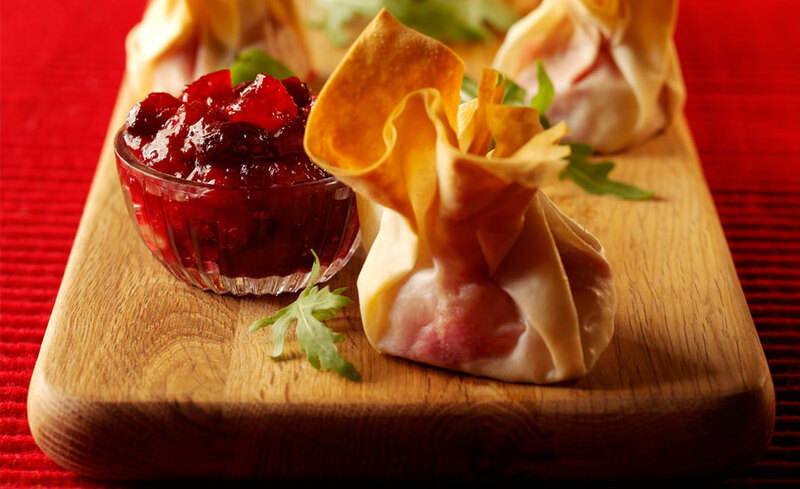 These golden, tasty and crispy filo parcels are perfect for parties and Christmas entertaining. They can be made and frozen ahead of time and simply cooked on the day – perfect if you’re trying to get a jump on the busy festive period. Place the cranberries in a saucepan with the sugar and add the orange zest and juice. Bring to a simmer and cook gently for 8-10 minutes until the cranberries have softened. Leave to cool. Pre-heat oven to 200°C / Gas Mark 6. Make the parcels by placing a sheet of filo pastry on the work surface (keep the remaining sheets covered in cling film). Brush the sheet with a little of the olive oil, place another sheet on top, brush evenly with a little more oil. Cut into four squares. 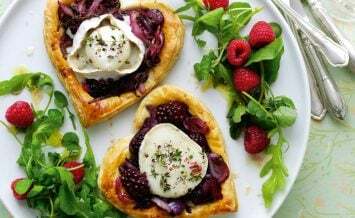 Place a 10g chunk of goats cheese in the middle of each square and top with a small teaspoonful of the cranberry sauce, fold the pastry around the filling and scrunch the top so it holds together, brush all over with olive oil and place on a baking sheet. Continue until you have used all the filo sheets and goats cheese. Reserve the remaining cranberry sauce to serve with the parcels. Bake for approximately 10-12 minutes until golden and crisp. 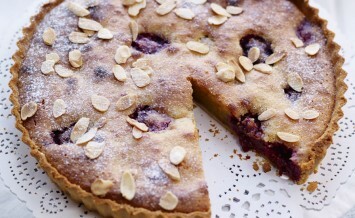 Serve warm with an extra spoonful of the cranberrry sauce, garnish with rocket leaves.